Hey everyone, this is Julia again. Getting sick of my lists? I hope not! 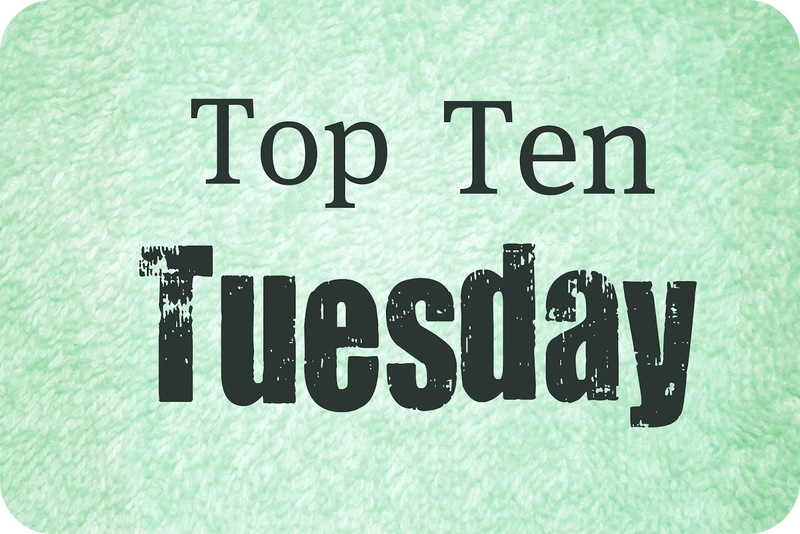 Today's Top Ten Tuesday is to help those of you who need some recommendations based on a particular book. The linky this week is going to be a smorgasbord of awesome recs, so if you are looking for that next book to read, today's TTT is for you! I decided to chose The Other Boleyn Girl for my list. I read this book ages ago, and it was the only book of the series or by Philippa Gregory that I have read. Regardless of that, I have decided this based on the fact that 1)lately I have been reading a lot of historical fiction (or epic fantasy with a hint of historical fiction) and 2) I wanted to showcase some novels that featured stories of women in history. It may not be the best list for this book, but it consists of books that I have read and enjoyed. Maybe you will as well. Who am I kidding, back to Russia! This story, though I read it ages ago, sticks with me as we follow some dramatic changes in our heroine's life. If I remember correctly, this may have been based on an actual person. Even if it wasn't, it stuck with me enough to make me think that it was. I enjoyed this more that I thought I would at the time and read it in a day or so. 17th Centaury Persia. A young girl torn from her future and forced into one she could never imagine. We follow the girl's twists and turns as she learns the craft and art of rug making, all while watching her struggle to live the life lot has chosen. Now let's pop over to China while we are in Asia. Back into the time of foot biding and daughters meaning nothing but mouths to feed, we have the touching story of two girls whose lives are intertwined. I loved the feel of China I got from this story. It reminded me of the countryside there. The language of women was fun to read about in practice. This book is full of delight. Let's get biblical! The story of the sister of Joseph (the one with the technicoler dream coat) and her mothers as told over the course of her years. I loved how being the only daughter she carries the secrets of The Red Tent and loves each of her mothers for teaching something different. Hop on over to the 20th century England, where two sisters are trying to marry their way out of a poverty they were not born into. Well, on of them is at least. This is a great coming of age story. Highly enjoyable. I just finished this one this weekend, and a full review will come, but this was such a good book. Four sisters in the time of the Crusades, each with different aspirations all dashed by the circumstances of their lives. Real history dashed with emotion sets this one up to be a good read. Family comes first. Moving on to the classics, Gone with the Wind is the first book to make me cry for literally tens of pages. You grow with Scarlett and see her be an occassionally nice person... not often but enough that she get's your sympathy or at least your empathy. I remember thinking that this book made me see the other side of the Civil War. I hope you enjoyed my list! Now let's look at yours. Link them up below! Great list! I have The Other Boleyn Girl sitting on my bookshelf, which I picked up after really enjoying the movie. I also haven't read any Phillipa Gregory, but I'm excited to get around to it! And I also completely adore Little Women. Laurie was one of my first literary crushes too. I wonder if there is a women/girl in the world who doesn't like Laurie? He is such a doll! I enjoyed the movie, but liked the book better I think. It is a long read though if I remember correctly. Hope you enjoy it when you do get to read it! Wow! I have only read Little Women and that is it. I will have to look into some of these. They sound interesting. I do enjoy historical fiction every once and a while. My TTT is for those who enjoy Vampire Academy by Richelle Mead. Oh, I love "I Capture The Castle" - Cassandra is such a likeable, relateable heroine. I like the sound of "The Romanov Bride" - I am slightly fascinated by Russian History because I only have a very broad grasp on it. I haven't read The Other Boleyn Girl but I've always been intrigued by it. I went a bit different route and did a hand full of YA readalikes instead of just 10 for one book. I think I kinda of did the opposite of you two weeks ago too. Great list. You few on here I would love to read someday. Especially The Red Tent. Fun. I loved The Other Boleyn Girl, and all of Phillipa's Tudor books. I need some more good historicals in my life. Thanks for the recs! Gosh, I LOVE historical fiction, and so does my boyfriend. He's more interested in the Ben Kane, Roman histories and the like, but I'm sure he'll love some of these too- he's a very liberal reader! I recently bought a few Philippa Gregory books, so I can't wait to read those, and I'm obsessed with Russian history, so I may check out The Romanov Bride soon! Thank you for sharing these, now all I have to do is make mine! Ohhh, I adored "The Other Boleyn Girl" and I LOVE historical fiction. Out of this list I've only read "Gone with the Wind" and "Little Women" so I'll have to check out the other 8! Julia, you need to read The House of Special Purpose - it's a stunning Romanov Drama with a very special perspective. Um yes please! Added to my TBR shelf as of immediately! Excellent list! I definitely agree with you on Little Women and Gone with the Wind. I'm pretty sure I have Mistress of Rome on a shelf somewhere, so maybe I should go find it. Great list! I loved The Jewel of St. Petersburg! I have been meaning to read Mistress of Rome for a while and hopefully I'll get to it soon. I do have to admit I haven't read The Other Boleyn Girl yet...but it's on my bookshelf! I love Gone With The Wind! Wouldn't have thought of it that way, but you're so right! Funny, I Capture the Castle has been on my netflix queue for ages - had no idea it was a book too! Maybe I'll read the book first! I haven't read The Other Boleyn Girl in a long time! I'll definitely have to check out some of the books on your list, because I don't read enough historical fiction. I saw the movie for this one, but I haven't read it yet, though I do want to. I love to compare the movie to the book :) I saw where someone wrote a sequel to Gone with the Wind. After the "sequel" to Phantom of The Opera called The Phantom of Manhattan by Fredrick Forsyth, I don't know if I ever want to try that again! Great picks! Hey, I had "Other Boleyn Girl" on my list too! I did pairs of readalikes, though - I couldn't think of 10 for one book! "Four Sisters, All Queens" has caught my eye before, so I'm glad to hear it's good. I have read quite a lot from your list! I love historical fiction so I'll have to check some of these out. I'm especially intrigued by your Romanov suggestions. Thanks for sharing! I love Little Women! I haven't read any of the others though. Great recommendations for fans of historical fiction. I've been wanting to read Snow Flower and the Secret Fan, glad to see you enjoyed it :) Hope I can get to it soon! Great list. I haven't read The Other Boleyn Girl, but I have read some of the others. You just convinced me to add it to my TBR list. I wasn't sure which book to write about, so I copied yours! I hope you don't mind-and I tried to list different books. I love your blog! I ended up using this as a reverse read-alike list, since I've read four of the titles you listed, but not the original. I was surprised to see "The Blood of Flowers", which I read after finding it on a take one leave one shelf in London. Great list! I've read a few of the books on your, and enjoyed them, but I have yet to read "The Other Boleyn Girl." I included it on my top 10 unread books on my bookshelf list last week, and several people commented and encouraged me to read it asap -- must do that soon! *on your LIST -- d'oh! Cool list, haven't read most of those though I did read "The Other Boelyn Girl". I chose Elizabeth Kostova's "The Historian" for my list. I also chose The Other Boleyn Girl for my Top Ten Tuesday, but our lists are entirely different. I'll have to check out some of your books! Oops. I just realized I did an older topic. I stumbled across it while I was Googling other book-related things and just ran with it, and then linked it here without even thinking. Oh well. I'll get back on track next week. I'll vote along with you for Little Women, Mistress of Rome and The Red Tent. All three are among my favorites, although I couldn't possibly come up with a top ten historical fictions--way too many great reads out there! Really great picks! I chose District 1 of Panem, as well as Cassandra Clare's Steampunk London! Can't wait to read more Steampunks! Wow, there were only 92 links when I checked this afternoon - well done!